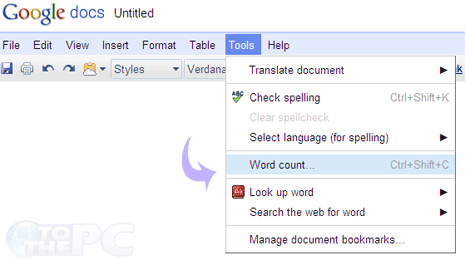 Google Docs is an online suite for word processing and spreadsheet needs. It is a robust online alternative for Microsoft Office software. It supports lot of basic and advance features for writing and editing word documents online. Besides writing text, you can process it further like counting number of words or characters in a Google Docs document file. 1. Goto http://docs.google.com & login into your account. 2. Create new document or open any existing document file. 3. Goto Tools > Word Count or press Ctrl + Shift + C keys. A pop-up windows show number of characters and words in specific Google Docs document file. 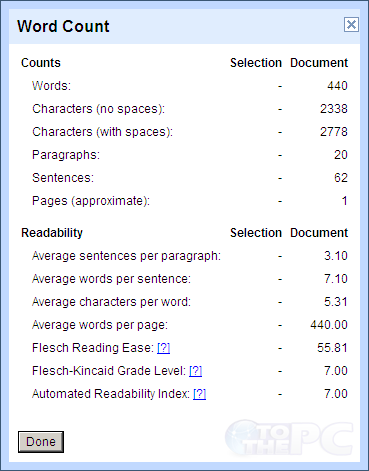 Besides character count, it also show lot of other information about your Google Docs word document.